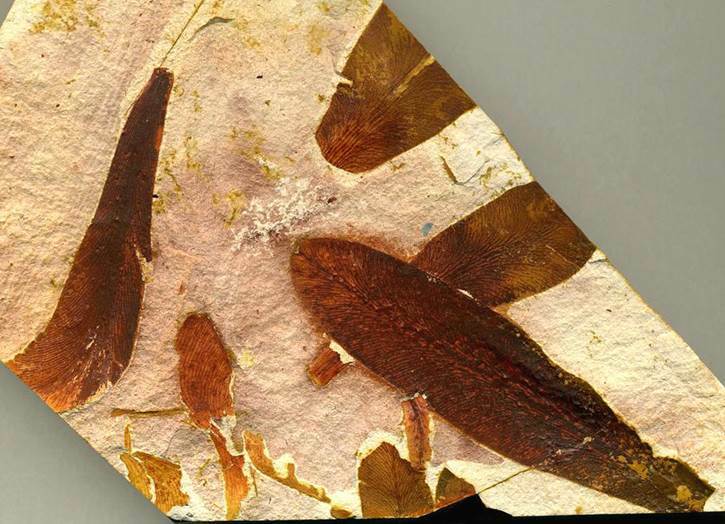 Glossopteris is probably the most familiar fossil leaf to non-paleobotanists. The name Glossopteris is Latinized from two Greek words meaning “tongue-fern”, referring to the elongated shape of individual leaves. Glossopteris was not a true fern - it was a seed fern (a group of primitive gymnosperms) (Plantae, Pteridospermophyta, Glossopteridopsida, Glossopteridales, Glossopteridaceae). Glossopteris is reconstructed as a large deciduous tree. The Australian rock shown below is a commercial fossil specimen with several hematite-stained leaf impressions of Glossopteris browniana Brongniart, 1831 (or Glossopteris indica Schimper, 1874 - I’m not sure which one this is). Glossopteris species taxonomy is notoriously convoluted, with >200 nominal species described worldwide. During the Permian, Glossopteris-dominated forests covered much of the ancient continent of Gondwana (= South America + Africa + Arabia + Antarctica + Madagascar + India + Australia). Glossopteris has tremendous significance in the history of geology. The modern-day geographic distribution pattern of Glossopteris fossils was a key piece of paleontological evidence that Alfred Wegener used in formulating his Continental Drift Hypothesis in 1915. Stratigraphy: Illawarra Coal Measures, mid-Kazanian or Midian/Tatarian or Dzhulfian Stage, Upper Permian. Locality: Dunedoo, Sydney Basin, eastern New South Wales, southeastern Australia. Glossopteris leaves in hard deltaic claystone (field of view 12.4 cm across) from the Upper Permian of Dunedoo, New South Wales, Australia.